I have never met Walt Whitman, and before John Robert Colombo introduced me to the writings of Richard Maurice Bucke, I had not read the poetry and writings of neither of them. 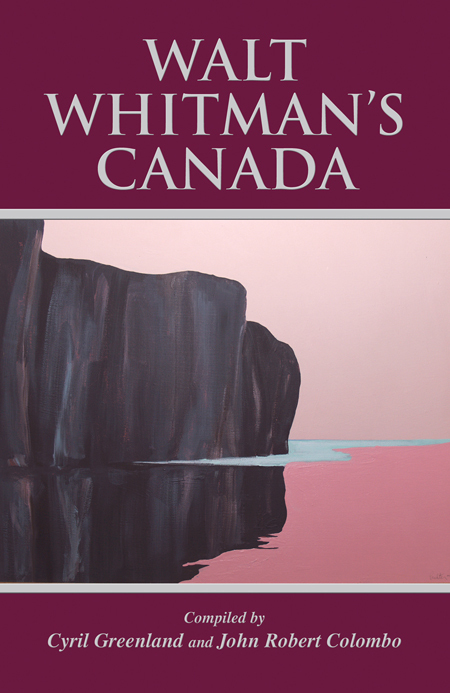 I thought of Walt as being a pioneer of the American Poetry tradition, and did not know that he travelled through Canada with Bucke well over 100 …years ago now. This new volume was originally published as a QuasiBook by Colombo and Company and is a very interesting,labour-intensive compilation of writings and photographs. I worked on it, on and off, over the last couple of years, but couldn’t decide on a suitable cover, other than reproduce yet another picture of “Old Walt.” JRC showed me a picture of an inscribed rock in Bon Echo Provincial Park which was donated to the province by the Denison family. There was an interesting, long, narrow boat floating in front of the rock containing many people in period dress. And then, last fall I had the pleasure of meeting with Charles Pachter in his studio in Toronto. (He has on Lake Simcoe too!) and we discussed using his art work for a cover of one of my proposed books, but that’s another story, and we concluded with a very interesting tour of the many floors of the studio, including the garage and the back shed. I noticed a un-titled picture on the wall in a back room and immediately asked “Where’s that?” Charlie replied “Bon Echo.” In an internet second, I had an epiphany, remembering the rock face inscribed “Old Walt” and with Charles’s permission we had an excellent front cover. Yes, there are pictures of the Rock & Walt on the back. I visited Charles again to show him a layout of the cover, and he approved, but he was having a hectic time packing his art to travel safely to a showing in British Columbia in conjunction with the Winter Olympics in February. You might ask where’s the moose? but the copyright notice states that the art was created in 1993, perhaps before the moose silhouette motif was created? However I do remember seeing a picture of a younger QEII on mooseback.